Brick Town Talk: I Wake Up and See Earth - LEGO Town, Architecture, Building Tips, Inspiration Ideas, and more! NASA Design Facilities - (BTT) On a cool, quiet morning, a rocket will make its lone departure from Earth. Off to where? Nobody knows, except a select few involved in the design and development of this new spaceship and its cargo. It's goal is simple. Colonize. This new Deep Space Habitat is a small but important step. It's interconnecting modules allow for easy assembly and operation. It will become the staging point of exploration and innovation. Just imagine, it's a boring Sunday evening on Earth, but on Mars, a small rover from the Deep Space Habitat finds a rich copper vein running through the cliff of an old lava flow. The concept of "galactic mining" is not far off. 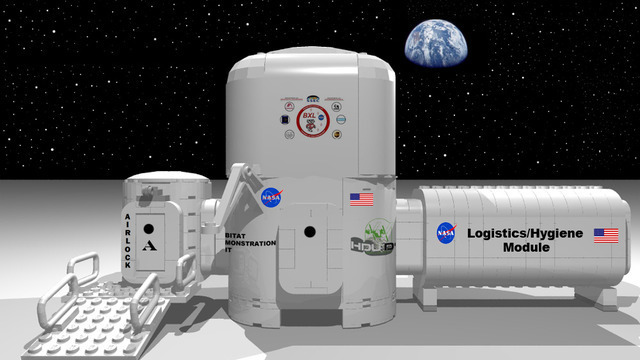 Check out the NASA website for the real Deep Space Habitat under development! I agree. Nice simple design! Welcome! Come in, be seated!